Rivers that are close to their original state, free of human modifications and rich in natural structure are the ideal habitat for the native sturgeon. These ancient migrating fish are returning to the River Elbe and the North Sea and to the River Oder and the Baltic. This is the successful outcome of a long-term research and reintroduction programme for the European and Atlantic sturgeon. In 2013, the programme was recognised as a UN Decade on Biodiversity project: A great accolade for the work of the Save the Sturgeon Society – and its partners. So far, scientists have been able to release over half a million young sturgeon into the Elbe and the Oder rivers – ambassadors of an intact river system and rich biodiversity. The United Nations declared the ten-year period from 2012 the UN Decade on Biodiversity. The aim is to make as many people as possible aware of the importance of biodiversity and of nature conservation – as the basis of existence for us all. In implementing this UN Decade on Biodiversity, we want to shine the public spotlight on as many projects as possible, so people see the kinds of things they themselves can do to help conserve biodiversity. Working together with a wide range of partners, regular restocking programmes are carried out in the Elbe, the Oder and their tributaries. In school projects, children learn about these fascinating migratory fish and about what it means to take responsibility for a species. In 2014, the European sturgeon was declared Fish of the Year. The juvenile fish – some of them are tagged – do not hang around for long in the stretch of river they are released in. Their destination is the sea: A long journey into an uncertain future, with countless risks. Germany’s Federal Environment Ministry and Federal Agency for Nature Conservation have funded this unique, multifaceted project since 1996. There is also another reason why the Federal Agency for Nature Conservation is so strongly committed to restoring sturgeon populations in the northern and eastern half of Germany: The sturgeon is a migratory fish species – a highly charismatic migratory fish species, and one that needs continuity in a river system so that the adult fish can migrate up-river and lay their eggs in the upper reaches where they have their spawning habitats. The juveniles of the species migrate back down-river along with the parent fish after spawning, only to return from the sea many years later. This cycle, this constant alternation between saltwater and freshwater habitats – this migration between two worlds – is so characteristic of the species, and at the same time representative of numerous other species, that the sturgeon is for us the ideal ambassador of ecological continuity in river systems. The sturgeon: our Fish of the Year 2014. Restoring and conserving intact river courses and diverse marine habitats for the sturgeon is a task for the future – ensuring that the reintroduced sturgeon can return from the sea to spawn in the upper reaches of rivers and their tributaries in twelve to fifteen years’ time, and ensuring that their offspring will find good conditions in witch to live. Finch’s Quarterly – The First Roe! Gunther Corsten-Gerhards on the production of that most luxurious of consumables: CAVIAR. Caviar is the roe from the sturgeon, the world’s most valuable fish. Their naturally protected surroundings have helped them ignore the evolution of millions of years. The Caspian Sea has remained deep and warm, with the sturgeon perhaps our only link to the stimulating, generous tastes and flavours known to our distant ancestors. 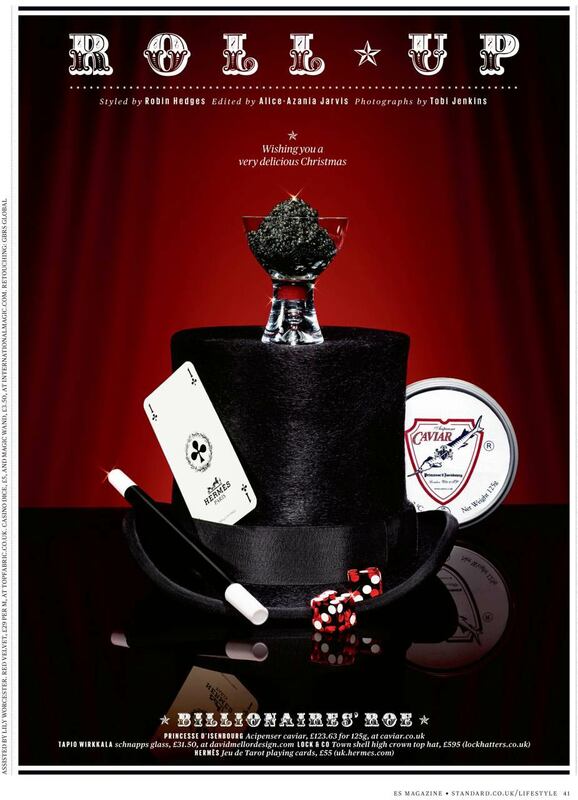 Caviar is a capsule of invigorating energy, filled with the proteins, minerals, vitamins and oils essential for life. It is eaten in a completely unmodified natural form, through knowledgeable careful handling and perfect transportation and storage. 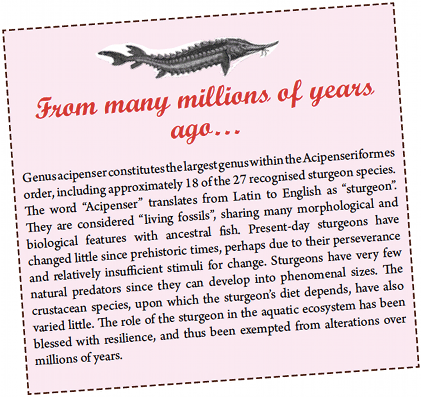 Sturgeons are harvested “in nature” during the spring and autumn spawning seasons. There were no international regulations concerning sturgeon fishing and the production of caviar until CITES, the Convention International Trade in Endangered Species, began to regulate all sturgeon trade as from 31 March 1998. Wild sturgeon was prevalent in Azerbaijan, Bulgaria, China, the Islamic Republic of Iran, Kazakhstan, Romania, the Russian Federation, Turkmenistan, Turkey and Ukraine, though only the former USSR and Iran were major historic caviar producers. In Iran, the well-known Iranian State Fisheries Company Shilat regulated the marketing of its three types of caviar: beluga, oscietra and sevruga. Shilat always air-freighted its caviar in special wooden Shilat boxes of 16 1.8kg tins. Beluga boxes had respective outer markings indicating either “Beluga 000”, “00” or “0”. Beluga sturgeons can live up to 100 years, create large, opalescent greyblue caviar with a delicate skin and a palate-tickling flavour. Oscietra arrived in identical fashion with outer box markings of “Oscietra A” and “Oscietra B”. Living for more than 50 years, the fish was famed for its variegated caviar, traditionally in shades of gold and pale browns. Sevruga also came in wooden boxes with outer markings of “Sevruga 1” and “Sevruga 2”. With a lifespan of 30 years, this sturgeon creates an intensely dark, almost luminous, though small caviar with a strong yet delicate taste. For centuries now, sturgeons have been caught and have been of the utmost interest from an economic, gastronomic and cultural perspective. To monarchs’ delight, the “Royal Prerogative” guarantees the possession of any caught sturgeons, while the latter’s delectable roe (only called caviar after the salting process) was championed as the ultimate, fitting luxury for kings and queens in those halcyon days. Furthermore, the sturgeon’s meat, which is customarily cured and smoked, established its gastronomic presence back in the 18th century and was popularised as “zakuska” – an elegant Russian hors d’oeuvres that quickly spanned across western Europe. Wild sturgeons underwent a dramatic decline and became rare and scarce as early as the beginning of the 20th century. They were driven to the brink of extinction, not because of accidents or their failure to adapt to natural changes but as a result of intense human interference, such as the construction of water dams, restricting the sea’s fresh water input, thus impeding the sturgeon’s migrations. remaining water was contaminated by agricultural biocides and industrial wastes. The pollution of the Caspian Sea, due to oil exploration, further decimated the sturgeons’ prehistoric habitats. The few surviving adults subsequently face vigorous overfishing and poaching without the opportunity of a lifeline to perpetuate. Repopulation has thus been severely curtailed, with human activities being the major contributory element to the demise of wild sturgeons. It is of paramount importance and of the utmost urgency now to call for and to develop, engineer and implement strategies for a conservation culture to aid and abet this species’ recovery in their natural habitats. In response to concerns that trade of sturgeon products might be detrimental to the species’ survival, 23 species were entered into the “Appendices of CITES”, the Convention on International Trade in Endangered Species of Wild Fauna and Flora, the International Regulatory Body of worldwide endangered species. The Appendices of CITES represents an agreement between governments whose members mirror those of the United Nations ( U N ) . The Sturgeon’s CITES listing aims to reduce and eventually completely eliminate the illegal trade of caviar on the world market. All Acipenseriformes species are controlled by various regulatory and enforcement means, such as Quota Control, Permits, Traceability and Coded Labelling. It is hoped that these implementation and enforcement structures will strongly contribute towards the conservation of sturgeon stocks, but in particular will aid the survival of remaining wild sturgeon stocks in the Caspian Sea. It is the world’s largest landlocked sea and home to six sturgeon species, which collectively used to provide in excess of 90 per cent of the world’s annual caviar yields. It all began with the beluga sturgeon as catalyst, being isolated as the Caspian Sea’s most affected and endangered species. This triggered during the following years a number of temporary import and export bans by both the US Fish and Wildlife Services and also CITES. However, the continual decline of wild sturgeon clearly became untenable. This resulted in CITES taking the unprecedented step in January 2006 of suspending trading of all wild sturgeon fish and caviar, in particular, beluga sturgeon caviar from the Caspian Sea basin, the Black Sea, the lower Danube River basin, and the Amur River basin in China. A year later, despite applied relaxation quotas to a number of species, the suspension forged profound implications to connoisseurs’ and vendors’ perspectives on the ethics of wild caviar and its sustainability. There are currently zero export quotas for wild sturgeon. Despite bans and the collapse in wild sturgeon, poaching and smuggling persists to a degree. It is envisaged that this “Zero Quota Status” will continue uninterruptedly. Sturgeon farming was first initiated in Russia. The early fish farms employed Russian techniques. Aquaculture plants are currently found all over Europe (ie, Spain, France, Germany, Austria, Italy, Hungary) and outside Europe in the US, the Middle East, South America, the Far East and China. The latter country, being subjected to far less stringent environmental controls, often tends to produce caviar termed unfit for consumption under EU regulations. Sudden chemical discharges often lead to partial or at times a destruction of a complete sturgeon farm. Marketing and a certain amount of snobbery is crucial to the entire industry; the more elusive the supplies, in the case of beluga, the higher the kilogramme:price ratio. Some still prefer wild caught sturgeon caviar, even though with much-advanced farming techniques the difference in taste has now become virtually indistinguishable. With females in season, harvesting takes place between October and March. For complete roe and meat purification, sturgeons are starved for up to eight weeks in freshwater clearing ponds prior to roe extraction. The extracted roe is almost solid, comparable to a semi-inflated tennis ball. It is only after salting that sturgeon roe may be called caviar. And the salt needs to do its work for at least four weeks, until the membranes of each egg have softened, making the caviar finally completely palatable. Opened receptacles showing excess liquid are always considered a flaw. Modern vacuum sealing methods cannot, however, always avoid the possibility of a number of eggs popping. Some roe will remain a little more resilient, whereas roe from other sturgeons tend to be slightly softer with the latter prone to produce a higher amount of breakage. Today’s caviar derives from fully sustainable aquaculture sources and represents one of the gourmet’s ultimate delights, immediately processed under the prevailing EU’s strict hygiene conditions. This is the celebrated sturgeon species. A wild specimen was caught, measuring over 9m and weighing a massive 1,400kg. It carries steel-blue to grey and black skin markings with light ventral and white creamy bony scutes down its back. Its flesh and its most precious beluga caviar represent an attractive undertaking as the actual perpetuation of this rare species. Being the second largest species in the Acipenser family, this is an ancient, freshwater, bottom-dwelling feeding fish and characterised by a long and large cylindrical body, subconical snout and four beard-like barbels at the base of its head. Reaching maturity within 10 years, the Transmontanus produces flawless, large-sized roe in a solid dark-chrome appearance. This is a true representative of the Acipenseriformes family. Aquaculture offsprings are reared to an average of 1.25m and rank second in growth rate and longevity. The rare diamond variety has beautiful star-like markings but they are invariably lost, turning grey-black in colour during adulthood. The Gueldenstaedtii medium-sized roes bear a delicious buttery, aromatic flavour, featuring ample colouration choices from gold, olive green via hazelnut brown to anthracite. The Siberian Sturgeon is the most popular and by far the easiest aquaculture species to breed. Resilient and tough, with a healthy and rapid rise to adulthood, this sturgeon will reach a maximum length of 1.2m in clean and comfortable aquaculture surroundings. The skin is brown-grey and black with the underside in contrasts of white. The end of its nose features a white tip. Siberian sturgeon caviar roes are of a medium size, typified by a deep-mahogany-brown colour with a velvety taste. This sturgeon was present in the Adriatic Sea water of the northern part of Italy and, with upstream migrations into the rivers Po, Adige and Ticino, reached maturity over a period of nine years. Wild specimens grew up to 2m but usually only up to 1.5m. Its colouring on its back is greyish-brown, olive-brown or almost black, with flanks lighter and belly paler or whitish. This one is best known as the stellatus or starry sturgeon, and is easily recognised by its elongated nose and head. This part of its anatomy represents 25 per cent of its total length. This sturgeon keeps its beautiful markings throughout its life. It reaches a maximum of 1.5m in the wild but considerably less in an aquaculture environment. All stellate sturgeons are keen jumpers. Despite its smaller physical attributes, roe remains small and graceful, appearing in luminous metallic-grey and with a memorable, fresh sea-salt flavour. The starlet is a slow-growing sturgeon of a very tolerant nature. In captivity it measures 0.6m-0.9m, reaching maturity over a period of 10 years. Distinctive features are white edge markings with lines along its back to the pectoral and front fins. The small and light blue-greyish roe sets it apart from the stellatus. Location: Once very wide-ranging – from the North and (Eastern) north Atlantic and Mediterranean coast of Europe to the Black Sea. The last remaining viable breeding population is in the Garonne River in France. 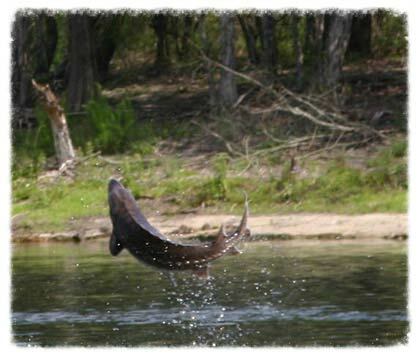 Habitat: Sturgeon are anadromous – spending part of their life in salt water and returning to rivers to breed. Main Threats: European sturgeon are also known as Baltic or, ironically, Common sturgeon. Once widespread in Europe, there is now only one population of European sturgeon left in the whole continent. This too is declining. Yet not many people know that the magnificent, pre-historic sturgeon, known for its caviar, is now as endangered as the black rhino. The adults spawn in freshwater. Juveniles then slowly make their way downstream and reach the estuary of the river of their birth at about 1 year old. They then go to sea after 2-6 years, and alternate movement between the sea while over-wintering in the estuary. For the next 4-6 years, they spend the summer in the estuary and return to the sea during the autumn. Adults stay close to shore in the sea, and are rarely found in waters deeper than 200m. This species of sturgeon now breeds only in one location, the Garonne River in France, where it last spawned in 1994. Bycatch is the major threat and the extraction of gravel in the Garonne is also a potential threat to the species. Dam construction, pollution and river regulation have led to loss and degradation of spawning sites. The current population size is now between just 20-750 wild, mature individuals. In recent years there has been substantial stocking, but these fish will not reproduce until around 2016. Under UK law, whales and sturgeons are ‘royal fish’, and when taken become the personal property of the monarch of the United Kingdom, although the Queen rarely accepts sturgeon when they are offered. The sturgeon is occasionally found in British seas, although most experts believe our fish to be vagrants from other larger European rivers. The Environment Agency will only begin to consider granting a license to reintroduce the fish if it can be established that there were self-sustaining populations of sturgeon in British rivers in the past. Throughout the 19th century there were numerous records of its occurrence far up British rivers, which suggests that spawning may have taken place in the larger British rivers at one time. 1. 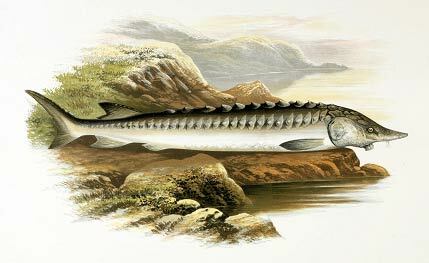 The sturgeon was common over 200 years ago in large UK rivers including the Severn, Avon, Ouse, some Scottish rivers and the Thames, with remnants of sturgeon found in the medieval remains of Westminster Abbey. 2. Fossilised sturgeons have been found in deposits dating over 54 million years old. They possess many primitive features, including a heterocercal tail (the spine continuing along the upper lobe), a cartilaginous skeleton, and a spiral valve in the lower intestine. 3. The head is covered with hard bony plates that meet to form visible seams. 7.1.1 For the Acipenseridae family, the name of the food shall be “caviar” or “caviar” completed with the usual name (Beluga for Huso huso, Ossetra for Acipenser guldenstaedtii and Acipenser persicus, Sevruga for Acipenser stellatus), in accordance with the law and custom of the country in which the product is sold, in a manner not to mislead the consumer. 7.1.2 For sturgeons having no common names, the name may be supplemented with the identification code or the scientific name of the species in accordance with Annex A. 7.1.3 For hybrids the common name shall be supplemented with the word hybrid, and the parent sturgeon species may be shown according to Annex A. It must therefore be noted that said Standard proves to be completely unqualified, incompetent and furthermore, contrary to CODEX’s own assertions, devoid of any scientific evidence. Said Standard is consequently wholly misleading, having neither ever been legislated, be it within the EU and / or any other nation, for that matter. Particular Standard therefore transpires to be a worthless “Draft Standard”.